Red-headed rock agama (Agama agama) in Kenya. Agama is a genus of lizards. It contains at least 31 species across Africa, where they are the most common lizard. They can be found in many sizes, from 5 inches to a foot in length and a wide variety of colors. One of the best known species is the red-headed rock agama (Agama agama), widespread in sub-Saharan Africa. 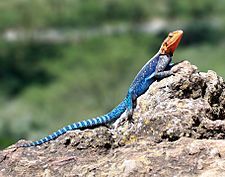 Wikispecies has information on: Agama. Agama Facts for Kids. Kiddle Encyclopedia.